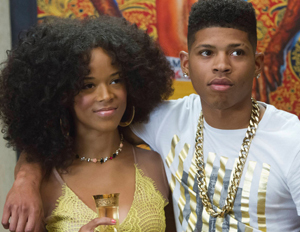 FOX’s new series “Empire”Â is making a recordÂ splash in the network’s ratings. The drama, starring Taraji P. Henson and Terrence Howard, “is the only primetime scripted series to grow in total viewers over each of its first five telecasts since at least 1991,” according to Entertainment Weekly. The mixed cast of veteran thespians and ripe talents has luredÂ an interesting blendÂ of fans, ranging from 18 to 49-years-old. One of its youngest leads is Serayah McNeill, the beauty who plays heavyweight label Empire’s rising pop star Tiana.Â The budding singer is hungry and focused, so much that she’ll even pretend a Kimye-esqueÂ relationship with labelmate Hakeem to build fan pandemonium. Judging by her brilliant delivery each Wednesday night, we would have never known that this is the 19-year-old actress’ first major role. 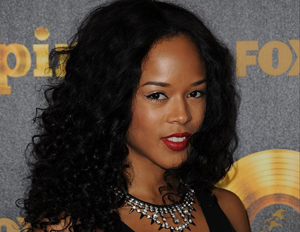 Serayah remembers riding in the car with her friend when she got a call that producer Lee Daniels loved her audition. “I went completely nuts!” she says with wide eyes and a smile even brighter than her promising future. BlackEnterprise.com and Serayah relive that moment in our sit-down about the number one show, what it’s like working with Taraji P. Henson and all that she’s learned on this thrilling journey. “Empire” is getting so much attention, even breaking audience records. What is it like being so young in this moment and working with major names like Terrance Howard and Taraji P. Henson? It’s something that I never thought would be for my first project. It’s overwhelming, but in a good way. I love working with them, and I get so much insight and pointers and tips from them on set. It’s a really good feeling to see us all and the show doing so good. We knew it was going to be good, but I don’t think anyone anticipated it being the number one show. What was life like before “Empire”? Before this show I was just doing a lot of modeling and print jobs in L.A. and auditioning. And that’s about it. I wasn’t on anything; this is my first big thing! It’s so crazy how life can seemingly go from routine and normal to a whirlwind of unexpected events. How did you get the role? I got a call from my longtime friend in high school and he told me that his stepmom is a casting director. My first response was, “First of all, why haven’t you ever told me that your stepmom was a casting director?â€ [Laughs.] But he told me they needed this role really, really fast and so she liked some of my pictures and I auditioned with her. She sent it to Lee Daniels and he loved me, and it was a really raw audition! The show is such a breath of fresh air right now because people are really longing for substance and quality scripted series. In a world of reality TV, this show, along with a few others,Â is really restoring balance. Right, and something real and something that you can relate to. One thing I always say about this show is it’s a lot of drama, but it’s family drama so people relate. Every family has some type of drama, and I think that it touches on a lot of the entertainment business and the music business. Some exaggerated parts, but it really does touch on some of the things that happen.